Problem-Attic can be a big help with curriculum development. It has several tools which are completely free—no subscription is required. You can use them to create your own database module, organize and share documents, and align questions to state standards, a textbook, or scope-and-sequence. The tools serve different purposes and appear in different places in Problem-Attic. They have two things in common: they help you adapt the question database to serve your particular needs; and they are most useful when documents are put into folders (on the Organize page). We are not going to discuss the folder system here, but you can read about it in online help. What follows is an overview of the curriculum development tools and screenshots showing where you can find them. You can get more details, including step-by-step instructions, by clicking the links above. Shared Frameworks is discussed further down, in relation to the Framework Builder. The second link, Favorite Problems, is where you’ll find “thumbnails” that you’ve marked with a yellow star. It’s a holding area for problems you like and may want to use later. Documents & Folders shows all of the questions you’ve selected previously, as if they formed your own database module. The feature is fully automatic. There’s nothing you need to do except click the link. Then you’ll see the documents you’ve created and (optionally) organized into folders. If you click the title of a document, you’ll see its questions. You can add one or more to your current document in the usual way, by clicking the Add button or by double-clicking on a thumbnail. The figures below show how documents and folders on the Organize page match up with My Database. For more information about Documents & Folders, and for an example of how to merge two documents, please click here. Here, when we use the term sharing, we mean with other teachers. For students, all sharing is done on the Create page, with the Make PDF, Export, and Score tabs. For teachers, sharing is done on the Organize page with what we call “public links”. You can share a link to a single document by clicking the three-dot Properties button, or you can share many documents at once by right-clicking a folder and choosing Export Folders and Links. The figures below show how to export a folder (with all documents and subfolders inside of it) as an HTML page. Sharing public links is different from sharing PDFs. One reason is that the Terms of Service limit what you can do with PDFs. Generally speaking, you are allowed to distribute them only to your students, in printed or electronic form. If you wish to share them with other teachers, then they need to be registered users of Problem-Attic. Also, PDFs are static, whereas the documents you share through public links are “live”. When a link is clicked, the Problem-Attic user gets a copy of the document, which is fully editable. The user can make changes to it, add/remove problems, adjust the formatting, etc. There are no restrictions at all on distributing public links, because Problem-Attic handles the contents and licensing of the documents. So this is normally the best way to share with other teachers. 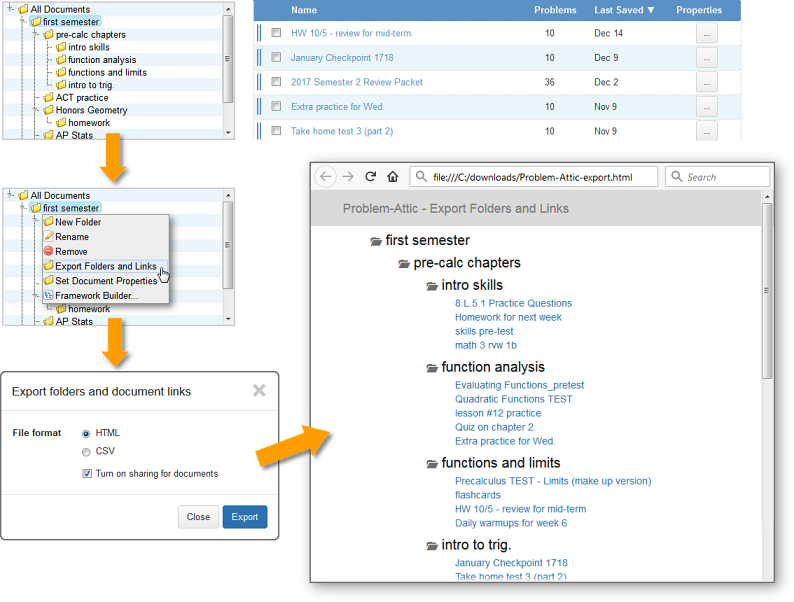 Professional Development – If you’re conducting a workshop, you can use links to show teachers representative questions or various formatting options in Problem-Attic. Curriculum Maps – Instead of showing textbook pages and question numbers, you can embed links to Problem-Attic documents right into your spreadsheet. Then teachers can quickly and easily make use of the questions. Blogs and Teacher Websites – If you want to publish your own lessons, you’re most welcome to include links to Problem-Attic documents for practice questions, quizzes, end-of-unit assessments, etc. You can even sell the lessons, as long as they include public links, not PDF documents made by Problem-Attic. Quick opening of your own documents – One of the options with Export Folders and Links is to create an html page (as shown above). You can open the page in your browser, copy the links, and paste them into an email, or re-use the html code for a school or district web page. For more details about public links and a discussion of “best practices”, please click here. This is Problem-Attic’s newest tool for curriculum development. You might think of it as a hybrid between My Database and Export Folders and Links. It lets you take a “snapshot” of your document and folder titles (at any level) and the questions that they contain. After taking the snapshot, you can share it with specific Problem-Attic users or, if you have a subscription, with all teachers in your school or district. Then they can see how you’ve organized the questions, and they can select them for their own documents. In short, the Framework Builder lets you create a fully customized database that works the same as the database which is built in to Problem-Attic. It can be organized any way you like, around state or local standards, teaching units, textbook chapters, etc. The teachers with whom you share it can see the questions by going to My Database on the main Select page and clicking “Shared Frameworks”. The figures below show the Framework Builder and how to view a shared framework on the Select tab (My Database). While a framework and public links can be used for similar purposes, there are important differences between them. A framework remains stable after it’s built. That’s why we used the term “snapshot” above. You can modify the source documents or move them into different folders, and this won’t affect the framework that you’ve shared. When you are ready to show off your new and improved framework, then you simply re-run the Framework Builder. You can use a framework to re-align questions to your state standards or learning objectives. If you think of documents and folders abstractly, as containers of questions, then the titles you give them can represent the standards. Problem-Attic has a nice shortcut for passing objectives (codes) through the framework, so you don’t have to assign them to each question. When you share documents with public links, the formatting of the documents is preserved. This is probably what you want for lessons and exams. A framework, on the other hand, does not include any document-specific information from the Format or Arrange tabs (except for the ordering of questions). It’s meant to be a customized database which has a hierarchical structure and which teachers will use to create new documents. For more details about building, sharing, and managing frameworks, please click here. We welcome your feedback about Problem-Attic’s curriculum development tools. Here is our contact information.